One night, across four cities, five children disappear. Years later, five enigmatic teenagers appear at an exclusive New York holiday party with their strange but beautiful governess, Madame Vileroy. Rumor and mystery follow the Faust children to the elite Marlowe School, where their presence brings unexplainable misfortune. Using a series of “gifts” given to them by Madame Vileroy, the children are able to soar to suspicious heights at Marlowe. The gifts seem child-like in their simplicity. The governess teaches them to cheat, steal, hide, and lie; ‘harmless’ she calls them, though they are much more. For the vicious over-achiever, reading an unsuspecting mind is simply to cheat. For the reclusive pariah, the gift of stopping time is just another way to hide. And who but an aspiring writer can weave a convincing lie? Soon, Madame Vileroy’s gifts become darker and more complex. Living in a gray home designed to cultivate and corrupt them, they are enveloped in the side effects of their own addictions. They live cursed lives, making deals with the devil as they claw their way toward their goals….that is until two of them begin to uncover secrets more shocking than their most unforgivable sins. A modern retelling of an ancient dilemma, Another Faust recreates the story of the Faustian bargain. Set in present-day New York, but spanning the centuries, it is a chilling tale of ambition, consequences, and ultimate redemption. Brother-and-sister team Daniel and Dina Nayeri present Another Series: classic works re-imagined at the elite Marlowe School, where characters of the past take on new life, in a modern New York. 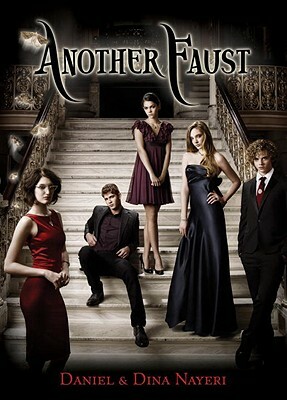 Another Faust is the first book in the Another Series. Their next book is titled Another Pan. OOOOOhhhhh this book sounds really cool. I love the cover, this would make for a great movie also.